The English word filigree derives from the Latin filum, a thread, and grano, a grain or bead, through the Italian term filigrana. Filigree exists as a design technique even further back in antiquity than ancient Rome. While now a specialization, earlier jewelers, especially in Egypt, the Middle East, Italy, France and Spain, considered it part of the jeweler’s art. This highly skilled craft reached an artistic peak in India in the mid-nineteenth century. Filigree was produced via a division of labor and necessitated the handiwork of wire-drawers and twisters, solderers, and polishers. The structure of these earrings is formed from coiled gold wire that creates a rich chain link pattern off of which pearls and beads dangle. The light weight of these earrings along with their curling tendrils would have allowed for their free movement on the wearer’s ears. The precious materials of gold and pearls that embellish these earrings indicate that they were likely worn by a member of the upper classes. Since metal jewelry was sold by weight, filigree work was popular since it required a minimal amount of metal to create a maximum effect. In addition to jewelry objects such as necklaces, belt buckles, bracelets and pendants, filigree work in gold and silver enlivened other Indian decorative objects such as betel boxes, spice trays, scent containers, and purses. These earrings as well as a manicure set show off the beauty and technique of Indian filigree work in a new rotation of objects currently on view in Passion for the Exotic: Lockwood de Forest, Frederic Church. The exhibition features de Forest’s decorative arts objects and Church’s drawings in the Museum’s Teak Room, the former Andrew Carnegie family library, an ornate interior with carved teak panels and stencil decoration designed specifically for the space by Lockwood de Forest. 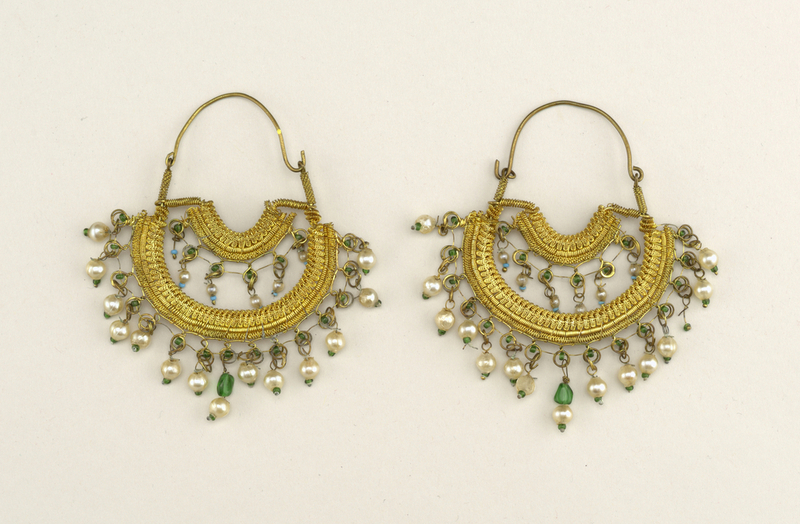 Earrings (India), late 19th century. Gilt and filigreed metal, glass pearls and beads. Gift of Frances Morris, 1951-111-88-a,b.